Ryla Pack Review- Buy or Bye?! April 18, 2018 April 18, 2018 by simplylynnblogxoLeave a Comment on Ryla Pack Review- Buy or Bye?! Happy Wednesday friends! I hope you all are doing well! I am so excited to be bringing back my Buy or Bye reviews! Today I’m reviewing the Ryla Pack Diaper backpack. Ryla was founded by Kelsie & Jeremy Rios. You guys, I’m just going to say it now. THIS BAG IS WHAT MY DREAMS ARE MADE OF! If you have been following along with me you know that I have a bag problem which is now a diaper bag problem. I have owned almost all of the diaper bags on the market. (I know, I got problems. LOL) But this is where it stops you guys. If you ask me which diaper bag is hands down my favorite bag? My Ryla pack is my FAVORITE bag. I’m being 100% honest. It is literally everything I want and need in a diaper bag. I use to over pack my diaper bag with things I thought I “needed”. With Ryla, it makes me think of what I TRULY need to have with me and the size helps me from over packing. You might be thinking, “Lynn, hello I need to pack all of the things.” Well girl, you can pack ALL the things in this bag! I took my Ryla bag to Disney World and you know what?! It fit ALL of the things I NEEDED for the trip and it was amazing! One of my favorite things about the bag are all of the pockets. Everything has a place and it is so easy to find everything! Another thing is that it keeps me hands free. I use to lug around a bag on my shoulder and try to hold a carseat. What was I doing with my life!! LOL Now with Lily being a wild toddler, I need both of my hands free to run after her. It is life changing! Another bonus with the Ryla pack is that it has a secret zip on the back where the changing pad is located. I put Lily’s iPad in this pocket to keep it safe! The quality of this bag is out of this world! I truly love it. So is this a Buy or bye? You already know it is a BUY! Head to RYLA to purchase yours today! Also, Ryla has pre-orders for their Ryla Ready bags! Ya’ll the light Gray color is to die for! Go and check them out! Hi everyone! Happy April! It has been awhile since I have posted. There has been so much going on! We are actually moving and on top of that we bought a house! Last week Lily and I both got sick and we are finally on the mend! At the end of February we took a trip to Orlando, Florida and Walt Disney World was so kind to give us one day tickets to go experience it! My husband and I have never been to Walt Disney World so we were both so excited to experience it together as a family! Let me tell you that it was the best vacation we have ever taken! Lily is a little under 2 but there was so much for her to do and ride! We started our day at Magic Kingdom. It was so fun to walk in and see the castle for the first time! Everything about our day was absolutely magical. We had an idea of which rides we wanted to do and used our fast passes! Our first ride was It’s a small world. IT WAS OUR FAVORITE RIDE! Lily even enjoyed it! We then went on the Winnie the Pooh ride & The Little Mermaid ride. We ate lunch in Tomorrowland and then went to the Huggies care center to change Lily’s diaper. You guys, the baby care center was AMAZING. It made it so easy to change her diaper and rest a little before we headed out again! Before leaving Magic Kingdom we had to try a Dole Whip! I mean if you didn’t try a Dole Whip did you really do Disney? lol We then hopped onto the bus to go over to Animal Kingdom! We had reserved fast passes to Avatar The River Journey ride. (My husband and I are big fans of Avatar so we were so stoked to be able to ride it!) It did not disappoint! There was so much to see! We ended up resting with some coffee while Lily took a nap in her stroller. (Sleep hard party hard right? lol) After visiting Animal Kingdom we went back to Magic Kingdom and walked around some more. We had a blast! We spent all day at Walt Disney World and we were already planning our next trip back! It was so much fun experiencing it for the first time with Lily and she even had so much fun! We can’t wait to go back next year! Disclosure: Walt Disney World was so kind to give us tickets but this was still 100% my honest review. What’s in my Ryla pack? March 9, 2018 by simplylynnblogxoLeave a Comment on What’s in my Ryla pack? Hi sweet friends! Happy Friday! I am so excited to be collaborating with my friend Mai on today’s blog post! 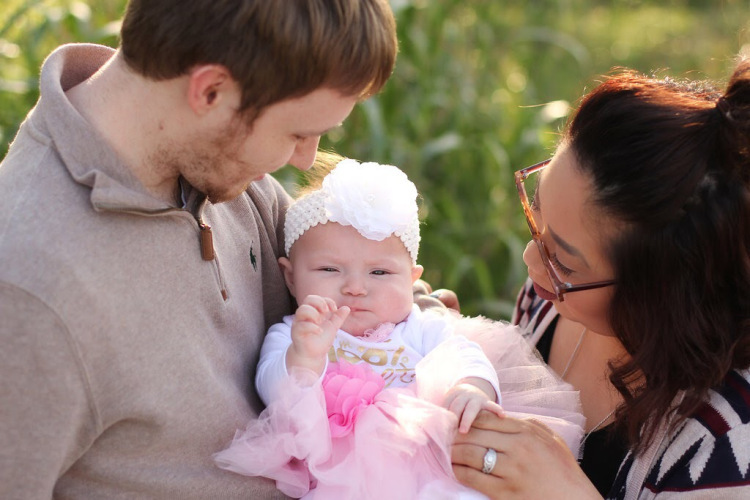 Mai is a fellow mama blogger from Canada & is married with two adorable kiddos! Be sure to check her out & give her a follow! I will be sharing what’s in my Ryla Pack and then be sure to head over to http://mamaindulgences.wixsite.com/mysite to see what’s in her Ryla pack! The Ryla backpack diaper bag is a sleek minimalist diaper bag! I love how it keeps me organized and looking fashionable. I took my Ryla pack on our trip to Disney and let me tell you TSA even complimented on my bag and said my bag was the most organized mom bag they have ever seen. #thankyouRyla LOL With my Ryla pack I’ve made sure to know what I do & do not need to in my diaper bag. I have a tendency to over pack but with the Ryla pack I pack just what I truly need. So, what’s in my diaper bag? Diapers: Duh, I always carry at least two diapers with me unless we are going to be gone for a long time then I’ll carry 5. Wipes: Again, DUH. lol I use wipes for diaper changes & for any messes. Clorox wipes: With the flu being terrible this year I’m wiping everything down when we go out. Most of the time stores have wipes but with my luck they’ve always been out so I bring my own. Trolls Sippy thermos: I either have milk or water in her sippy cup. I carry the thermos so it will keep her drinks cold! Pacifier wipes: Because kids. LOL If she drops her paci while we are out I can clean it real quick! Snacks on snacks on snacks: Snacks are a life saver. Can’t ever go anywhere without snacks. Wallet, keys, & phone are always in my bag as well. If you have a Ryla bag, what’s in your bag? I’d love to know what are must haves for your diaper bag! Don’t forget to head to my friend Mai’s blog and check how she packs her Ryla pack! Happy Wednesday friends! If you have been following along with me on Instagram you know that we just got back from our family vacation in Orlando Florida! Let me tell you that the vacation blues are very real! I’m already planning our next vacation back! Stay tuned for our Disney World blog! Since we live in the middle of the country and were not wanting to drive 20+ hours with a toddler we decided to fly to Orlando! We recently partnered up with Mitsubishi to test the 2018 Mitsubishi Outlander. Let me tell you that I fell in love with it instantly! With flying with a toddler we of course have to have all of the things! Our Mitsubishi Outlander fit all of our luggage and even had more room! Multiview camera system – Not only did it have a back up camera but it showed your view and what was surrounding the car. IT WAS SO COOL! MPG 25/30 – For an SUV it has awesome gas milage! The Mitsubishi Outlander road nicely. In the city and on the highway it was very smooth. You could barely feel any bumps! While we were driving and in the SUV it felt very safe. It would alert us when someone was in our blind spot which again was my favorite part! Another favorite would be the cruise control! Once you are set on cruise and the car in front of you slows down the Outlander would slow us down too. It was SO cool! If you are in the market for a new SUV you definitely need to check out the 2018 Mitsubishi Outlander! You will love it! Disclosure: This was in partnership with Mitsubishi. However as always, this is 100% my honest review. Happy Tuesday sweet friends! Finding the perfect car seat is always hard! There are so many car seats on the market! But one brand that I know and trust is Graco. When we brought Lily home from the hospital we had our beautiful Graco Snugride click connect car seat and from then on we were Graco hooked! I was sent the Graco 4Ever Extend2Fit Platinum 4-in-1 Car Seat and you guys: THIS IS THE BEST CAR SEAT EVER. The thing I loved most about the carseat is that it can grow with Lily! This will be the last car seat we will have for Lily! We can use this car seat for 10 years! from 4lbs to 120 lbs. How awesome is that?! Another cool thing is that the 4ever Extend2Fit Platinum allows up to 50lbs so your child can stay rear-facing longer! They even have the Extend2Fit position extension panel that gives more leg room! Lily has been loving her new car seat! She is more lifted and she can see out the windows so she enjoys riding in the car! Plus I know and trust that she is safe in the Graco 4ever Extend2Fit Platinum 4-in-1 car seat! If you are looking for a car seat: LOOK NO FURTHER. Head to Graco 4Ever Extend2Fit Platinum 4-in-1 to get yours today! Disclosure: This was in collaboration with Graco. I was sent the car seat but this is 100% my honest review. Incredibundles Giveaway – Diapers for a 1 year! February 26, 2018 February 28, 2018 by simplylynnblogxoLeave a Comment on Incredibundles Giveaway – Diapers for a 1 year! Happy Monday friends! I hope you all are doing well! I am so excited to be talking about this amazing giveaway Incredibundles is doing! If you have never heard of Incredibundles they are the home of the bestselling Year of Diapers baby gift! Incredibundles wants to make life easier for one mom by giving them a year full of diapers! How amazing is that?! The details to win will be on my Instagram feed! I have talked about Incredibundles before and how amazing their company is! It makes gift giving so easy! It’s hard to sometimes find the perfect gift for an expecting/new mom/mom. Incredibundles.com has the perfect diaper subscription. I mean who doesn’t need diapers? You can either do a 3, 6, 9, or 12 month diaper subscription. Here is how the subscription works: After you choose how many months you want the subscription to be, IncrediBundles.com sends a cute annoucement package featuring a plush teddy bear nestled in one of the company’s chic, trademark storage containers. The teddy bear holds a certificate that announces your gift to them! On the certificate there will be a unique code that the recipent will use to activate their subscription. Each month the recepitent can log in to their subscription and can make changes as needed such as size or brand. Incredibundles carries the major brands- Pampers, Huggies, Luvs, and Member’s mark. I love how Incredibundles.com can either send the package to the receiver or send it straight to me so I can give the gift in person! Good luck to everyone entering in this amazing giveaway! Happy Wednesday friends! Anyone else a fellow diaper bag lover? Well, I think I truly have found my FAVORITE one hands down! Where has Lily Jade been all my life?! The great thing about my Lily Jade is that it doesn’t even look like a diaper bag! Today I wanted to talk about What’s in my diaper bag and how my Lily Jade crushes it! All Lily Jade bags come with 12 pocket removable organizer that can be washed and a changing pad! Can we also just take a moment and admire this beautiful color inside the Madeline?! It gives me all of the heart eyes! I love to be organized and this organizer is literally the GREATEST thing in the world. The Madeline bag is just the perfect size! It isn’t too big but is not too small! I love how I can just take the organizer out and leave it at the grandparents house when I want to have a date night with my husband! You can wear this bag 3 ways: Backpack (which is every toddler mom’s dream), messenger style, or carry it on your shoulder. Disclosure: This was in collaboration with Lily Jade but this bag rocks my world!